Ah, it’s finally spring in the northern hemisphere, at least officially that is. It’s the time for one of my favorite parts to spring besides the newly awakened flowers – the bird activity! The snow birds are leaving town and both our ‘normal’ varieties of avian creatures as well as unusual visitors will be showing up through this next month. Then the sweet but noisy baby birds will be coming! I am one who admittedly has a “life list” of species I’ve spotted, and although birding is no longer as serious of a deal that it was when I was a teen, I now have a dress for that. Novelty prints are not really my “thing” but this bird one is winning me over. 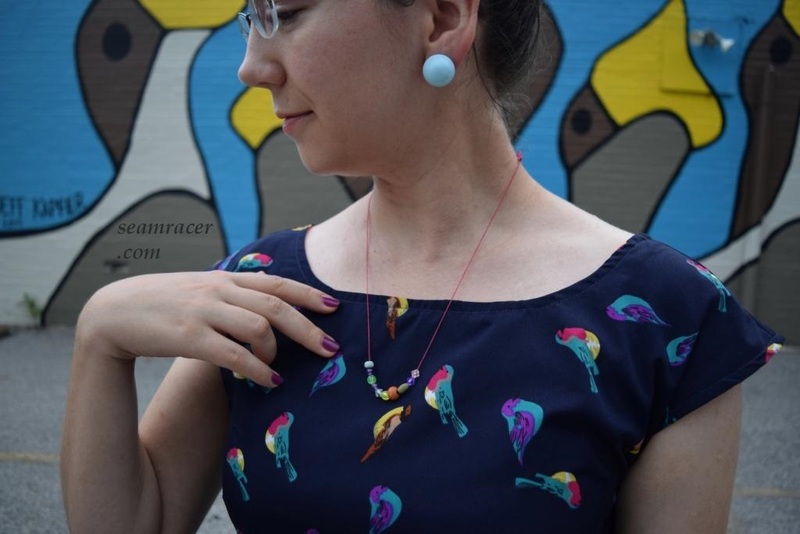 It is such a bright and cheerful print of what is probably fantasy songbirds, but they remind me of all my vivid-colored, real-life favorites – the kestrel, the redstart, orioles, warblers, or my ‘yet-to-be-seen spotter’s life goal’ the painted bunting. However, this post’s title is appropriate in more than one sense! With its swishy, full, mullet hemline and peek-a-boo flashes of skin, my dress is fully lined in a hot pink cotton for both unexpected fun in my fashion and to have a non-poly comfort against my skin. I’m carrying a celebration of cheerfulness with me when I wear this dress! The fact that this dress has received top rating from my 6 year old is proof of the happiness this dress exudes. He always laughs, smiles, and is like glue to me just to study the print – if I ever want to make his (and my) day better, I wear this. Want proof? My son made me a necklace that matches. It was totally a surprise project of his. Someone brought a beading kit to keep the kids busy after church one Sunday and he was busy making something for me in all the colors, but extra beads in especially the ones I love – turquoise, purple, and pink! Together with earrings from my Grandma which remind me of baby robin eggs, this is a combo that is spring and summer embodied for me. NOTIONS: All I needed was thread! TOTAL COST: I didn’t really wait for a sale to buy this – it was too cute to wait and see if there was going to be any left! However, I did buy it years back at the (now defunct) Hancock Fabrics so sorry if you want some, too! It was about $7 for each of the 3 yards…and the broadcloth was a few dollars a yard too. Thus – my total is about $20. Everything matched up well for this pattern and the instructions were decent (not as great as sometimes). However I did go up in size and I’m glad I did. 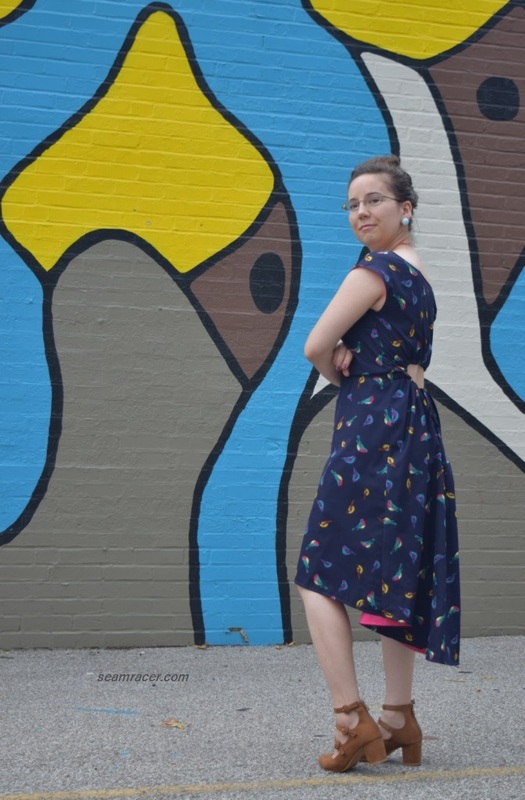 The bust and shoulders seem to run small in my opinion, but then again I did not want a tight fit for a breezy balmy weather dress made out of a non-stretch woven material. 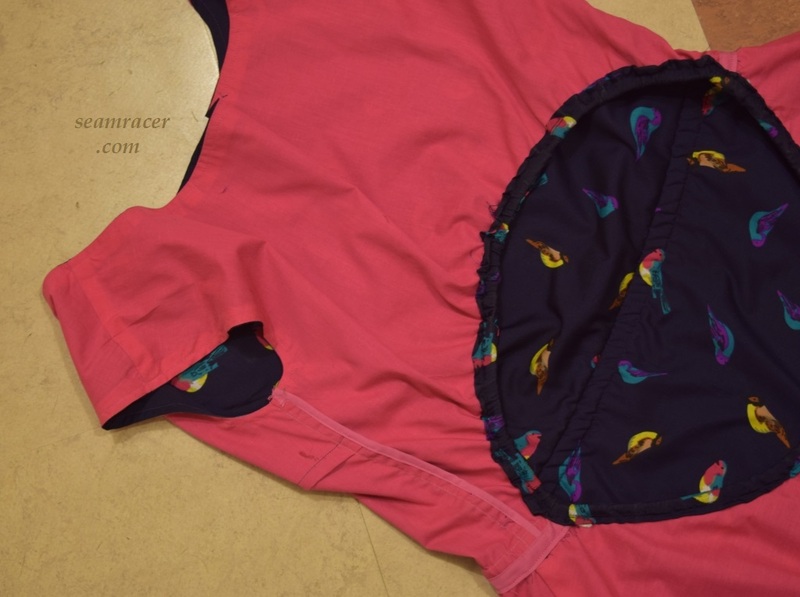 I also brought the shape of the neckline in just a tad – straightening out the dip of the scoop in front and bringing in the sides so as to cover my brassiere straps better. The neckline now appears to be more of a wide boatneck, but it is still easy to slip over the head as well as complimentary open around the neck, just now compatible with normal lingerie. Finally, I slightly lengthened the front half of the hem line to the skirt. All these changes I am so glad I had done at the cutting stage. I do not think I would like my dress as much as I do if I hadn’t have done such adjustments. I do love how this dress is a balance of simple and complex depending on how you look at it. The pattern pieces were rather interesting, too. From the front it has clean lines – straight, shorter skirt and a basic bodice with cut-on kimono cap sleeves and only a flashing hint of the ‘party in the back’. 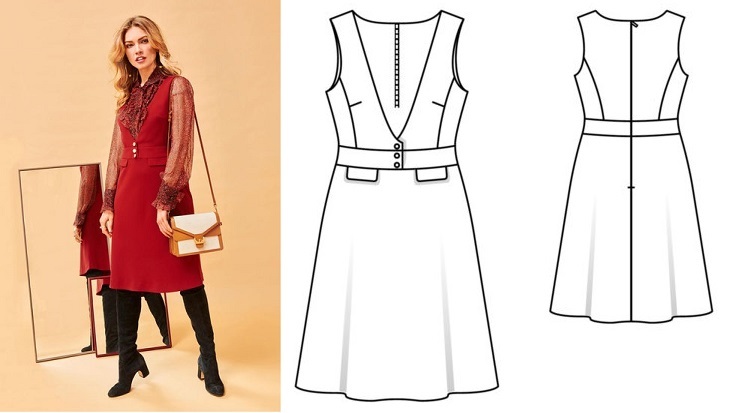 From the back, the skirt has a full sweep – like a lovely cape – in midi length and the bodice is separated from the waistline for some skin baring in an uncommon spot. The cut out ‘window’ at the back waistline more than just a feature, though – is adjustable with a drawstring going through the casing made around the oval opening so you can customize your coverage to your liking. I love when personal preference is considered in fashion! This design also makes this dress a pull-on which needs no zipper! 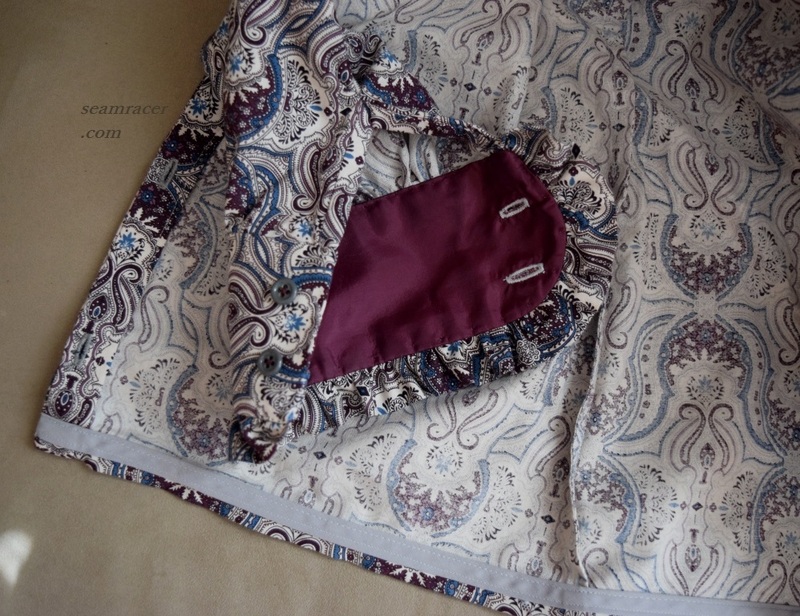 You loosen up the gathers to pop it on, then pull the drawcord ends (one long 1/4 strip made of the dress’ fabric) to close the back as you prefer. The back opening as you see it on me is almost as small as it will go, so if you like this design, too, keep that in mind. The half waistband that is in the front of the dress merely basic and comfy elastic kept in a casing made of the seam allowance. Such a design detail of an open back above the waistline can be seen on the sporty dresses and versatile playsuits of the vintage world of fashion. I notice similar styling from the 1940s to the 1970s. 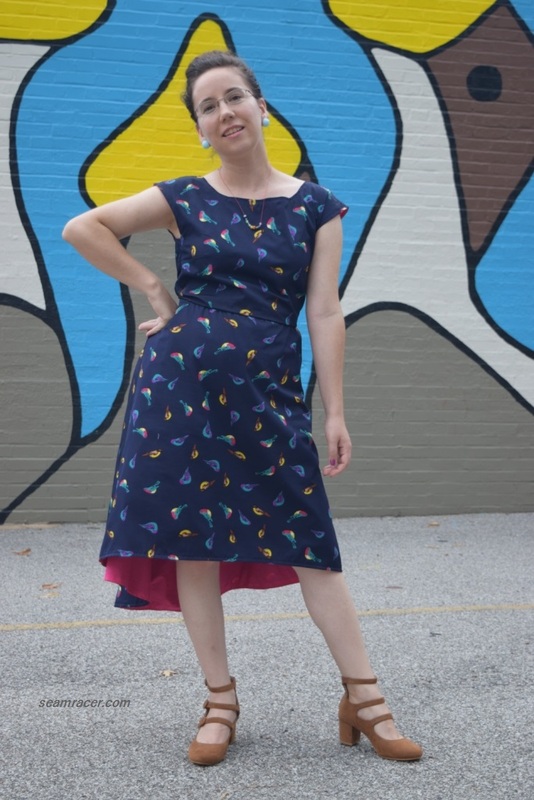 In the case of this Burda dress, the back opening sort of makes it look like the bodice is only connected at the front and side waistline. In the cases of vintage styles which are similar the bodice and bottoms can be actually disconnected for completely versatile set! 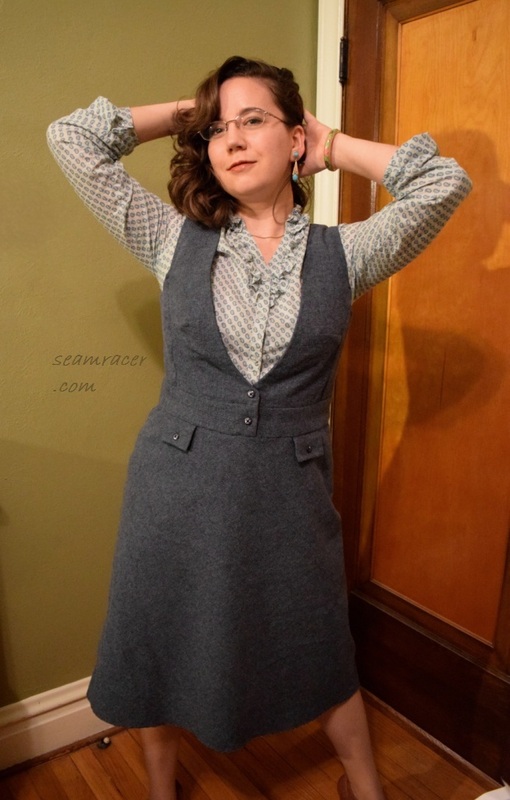 There is a modern (readily available) New Look sewing pattern which offers the same cute and ingenious styling as the 40’s and 50’s counterparts I showed as just a few examples. However, none of them include a high-low hemline, as well. 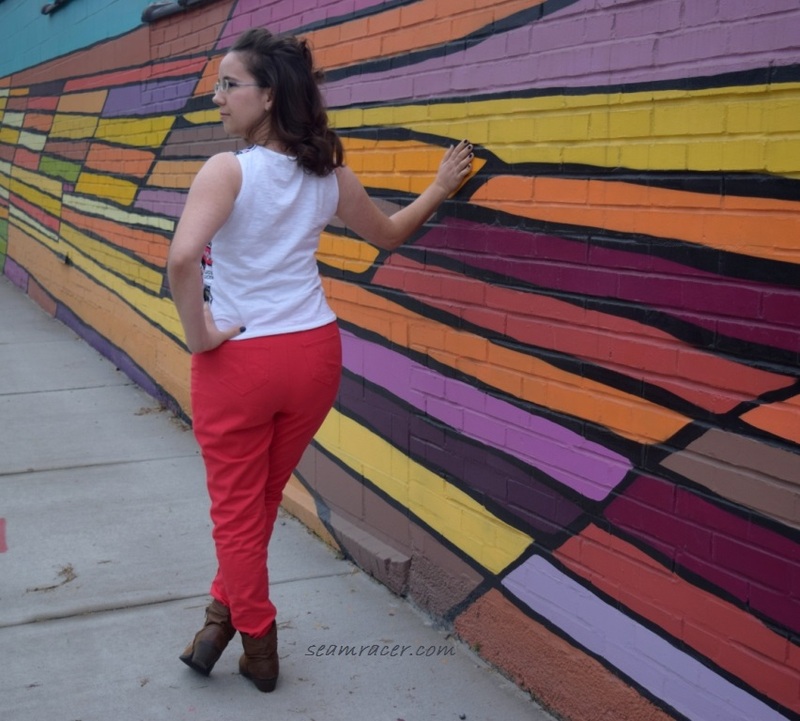 If you’ve been following my site for awhile you may have noticed I do enjoy a high-low hem. This style of skirt does show up here and there in my projects because I like it only in small doses. This particular variety of a mullet hem is my favorite yet. It has a fantastic sweep due to the back opening gathers – just the back half of the skirt was such a large pattern piece it practically was one yard in itself. 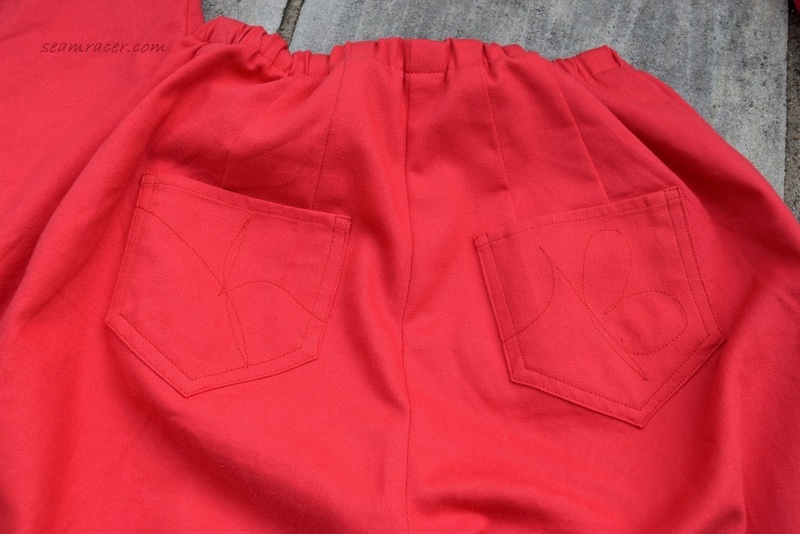 The lining underside the skirt really makes the most out of the hem shape because if you’re gonna see the ‘wrong side’ make it worth noticing. Full body lining is the absolute best thing for this dress, I do believe. The pattern needs to be amended from henceforth to include this step. I don’t know about you, but I hate the feeling of a polyester fabric on my skin…man-made fibers aggravate both my body and my mental state in more ways than one. 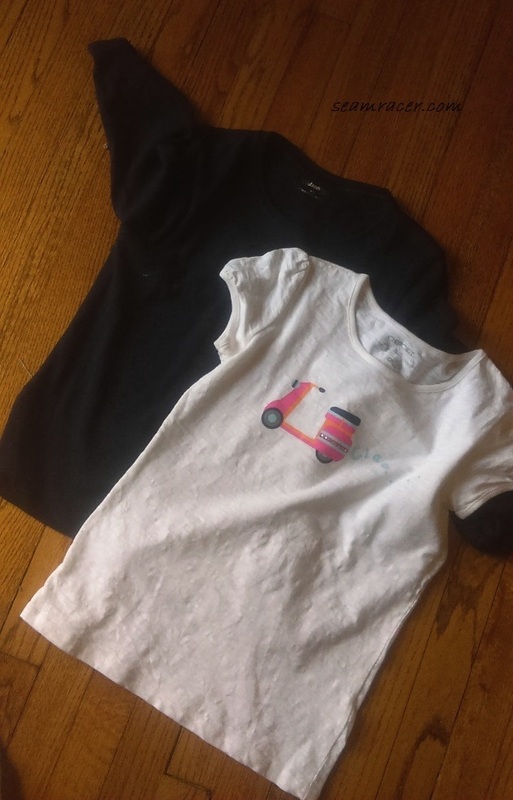 So – to keep both my sanity and comfort whenever I do succumb to the cuteness of a polyester fabric, I line such garments in good old cotton broadcloth. No, really, though – full body lining also makes the edge finishing so much cleaner and fuss-free. No tiny hemming to do, and no raw fraying edges to deal with either. I love a clean inside as much as I love how nice my garments look on the outside when on myself. 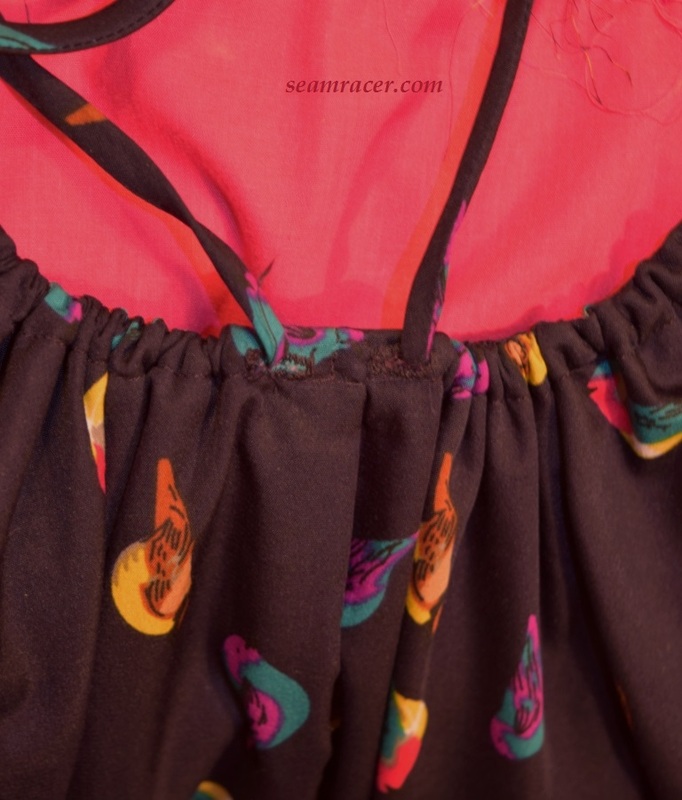 You can see the clean, no-seam hot pink lining side through the open armholes, too, and do so enjoy a garment that has its innards visible when they are done as nicely as this! It’s not that much extra work – sure it takes twice as much fabric – but it is worth it in the end product. For me, I guess sewing is not just materializing an idea or feeling, neither is it just crafting something I need or want. I suppose my habit of finely finished insides say that what I love about sewing is the beauty and the art of it. 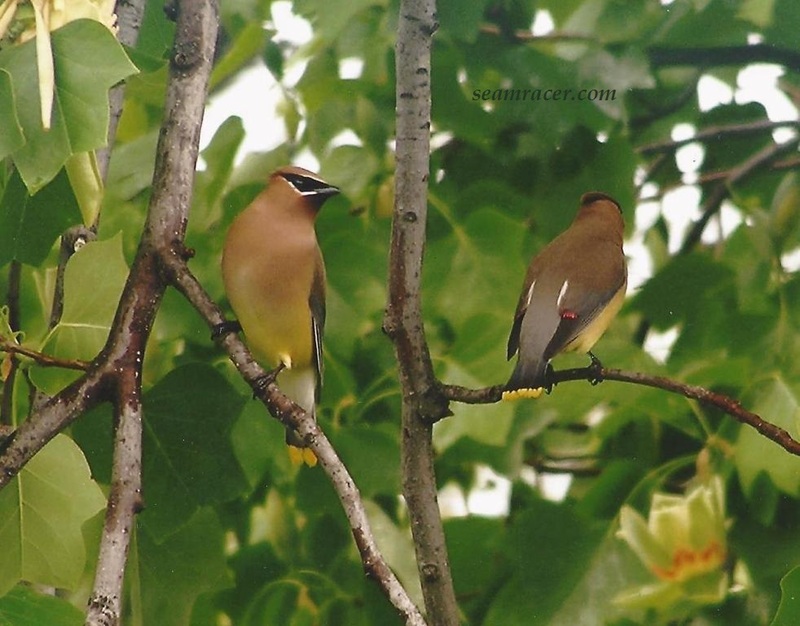 Cedar Waxwings I spotted in my parents’ backyard! The ultimate magnificence is in nature, however, and birds are the cheerful feathered announcers that living is to be celebrated. I am lucky to have had up-close and personal time with birds – especially the time I took a class on bird banding as a teen and actually held my favorite local feeder visitors. Then, there is the time I was by a creek painting some flowers and a hummingbird buzzed me, coming up to within inches of me, seemingly thinking I was something which needed checking out. Yes, the thing I love about birds is the best way to enjoy them – stop the busyness of life, listen with your heart, and soak in the cathartic benefits of realizing their simple but indispensable existence. Something as insignificant as this post’s home-made piece of clothing, no matter how fabulous, reminds me of the greater beauty of life around me. 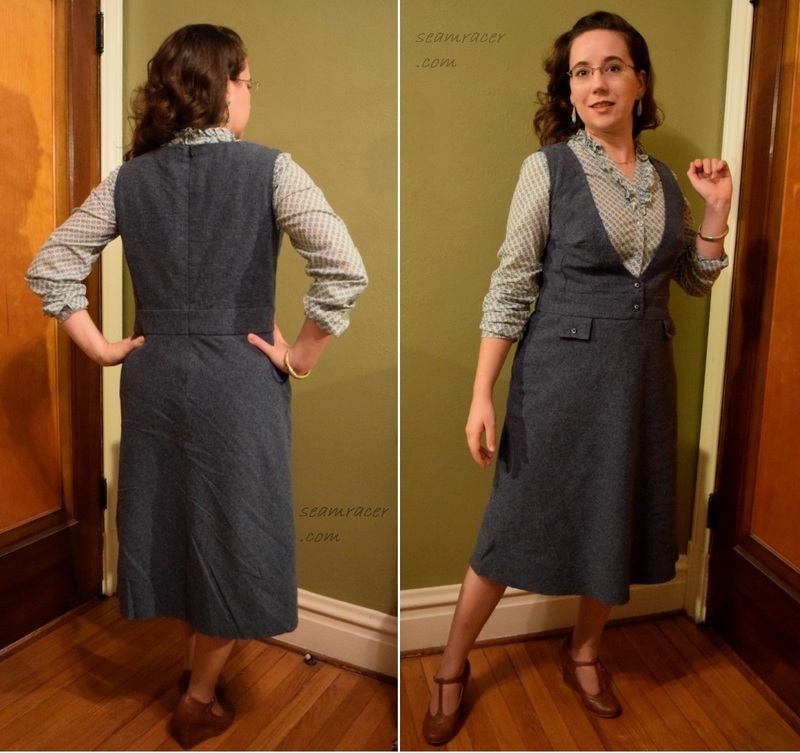 This is my November make for my monthly pledge for the “Burda Challenge 2018”. 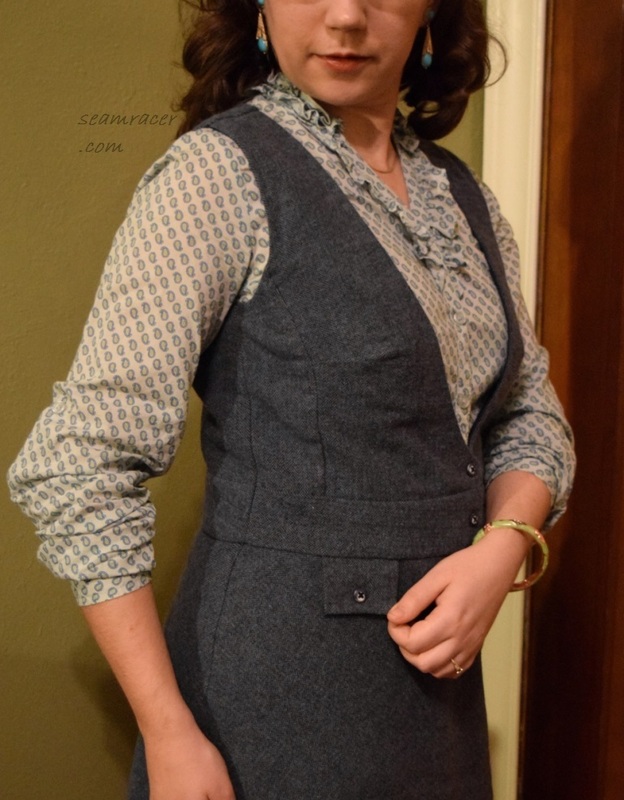 Next up to match this blouse and give me a full vintage-style Burda outfit is the “Waistcoat Bodice Dress“ for my December project! The model picture does show the two worn together. 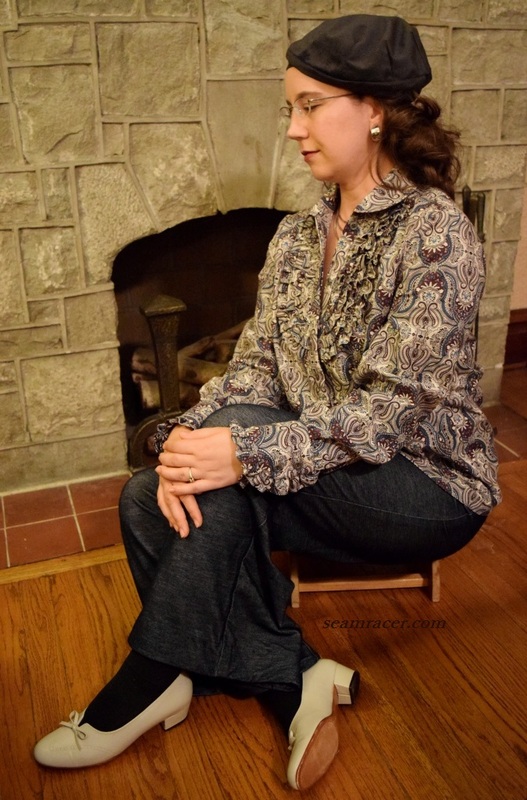 The pants you see with my pictures are my 1974 knit jeans (post here) to amp up the casual and alternative style, but really this blouse goes with so much – jeans, skirts, and especially my purple 40s pants! 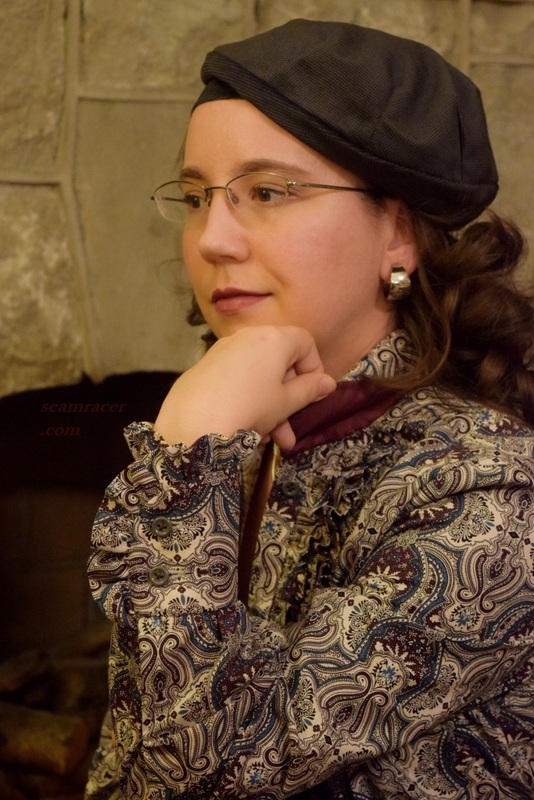 A beret hat is essential to the Beatnik style, and mine is me-made from a vintage 1934 pattern (post here). My shoes are true 1960s vintage beauties as well as my earrings. TIME TO COMPLETE: This took a lot of hand-stitching and detailed work, so I lost count of time but I’m guessing I spent about 30 plus hours to make this over the course of a week. 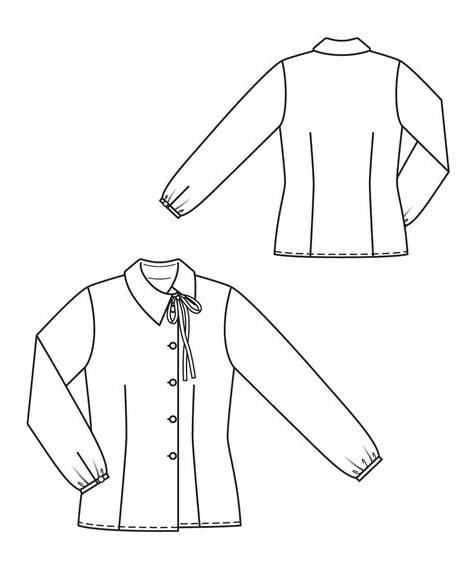 The blouse was finished on November 21, 2018. TOTAL COST: I’m counting this project as free since it’ fabric has been in my stash for a good number of years and everything else was on hand! Beatnik subculture is loosely defined as both a media stereotype and a generational literary movement between the mid-1950s to mid-1960s. The term “Beatnik” is said to have been coined by Herb Caen of the San Francisco Chronicle on April 2, 1958 and its expansion paved to way for the hippie culture of the later 60s. 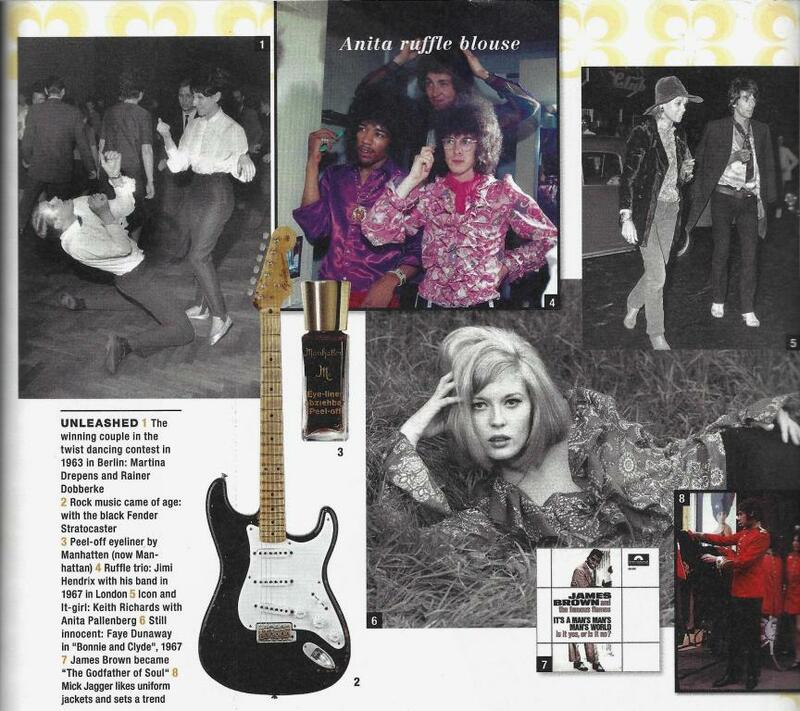 What I find the most curious about beatnik is the influence it had on fashion through music. One of the leading figures of the Beat Generation, Allen Ginsberg, an American poet/writer, was a close friend of Bob Dylan and the Beatles, two of popular Beatnik musical performers. The Beatles supposedly even put the “E” in their name because of Beatnik and Beat writer William S. Burroughs was on the cover of their album Sgt. Pepper’s Lonely Hearts Club Band. Their iconic, gaudy vintage-style military uniforms for that album were only a small part of the new awakening to reaching for past styles to standout, be unique, and express oneself that we have today. Beatnik wanted nothing to do with anything that had to do with the eras of their parents, the 40s, and 50s and had no taste for designer trends. The styles of the 1860s to 1890s, only 70 to 100 years old back then, were coming back with the ruffled neck shirts (of Edwardian times for women, early 1800s for men) being one major beatnik movement interpreted with my Burda Style make. When you turn the perspective, this isn’t too different from what the vintage community of today does – garments from the 1910s, 1920s, up to the 60’s are still extant, and bought and sold to both wear and appreciate but the 70’s, 80s, and 90’s are still mostly only being appreciated by those too young to remember them. When the London “Granny Takes a Trip” store opened in the mid-60s and stocked it with second-hand, outdated clothes, the Beatniks welcomed it and a whole new “thing” had begun. The late Beatnik trend of the ruffle blouse was not just popular because of the big names that were wearing them, but also because they were seen as a unisex item, pretty much the first of its kind. It was part of “Granny Takes a Trip” and the artists and writers of the Beatnik trend to focus on inclusiveness and loose sexuality. However, the limelight did help the ruffled blouse popularity. For the Rolling Stone’s concert in Hamburg 1965, much of the crowd was said to have been wearing ruffled neck tops, and for their “No Filter” tour just last year (2017), what do you know…Jagger is wearing ruffled neck shirts for a few of the performances. Jimi Hendrix’s famous scene when he set his guitar on fire at the 1967 Monterey International Pop Music Festival made history in a ruffled neck shirt. More inspiration can be seen in Burda’s collage photo. A recent Royal Mail stamp from 2012, commemorating contribution to British fashion by designers, even features a ruffled neck blouse for the 60’s! 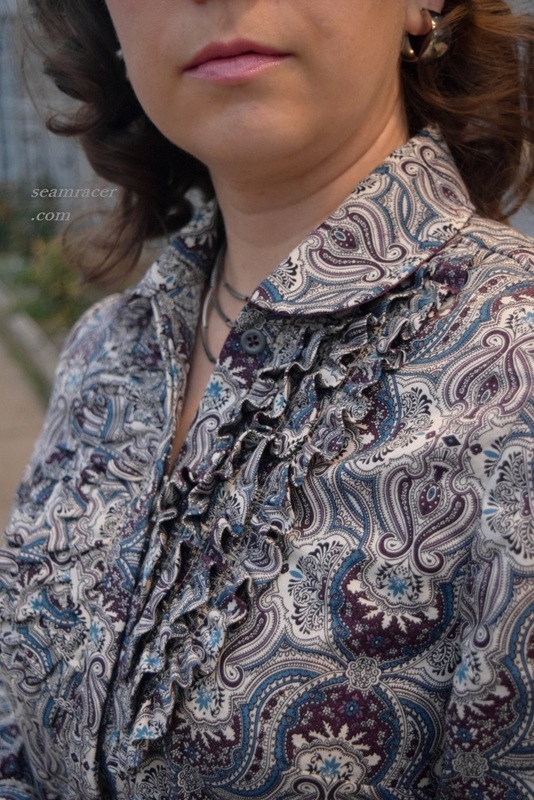 The paisley print in my blouse is a trippy sort of psychedelic prefiguring the later 60s, yet it is in the rich, darker, subdued colors that the Beatnik trend preferred. The busy print calls to mind old textiles and the Kashmiri “cashew print” seen through the later 1800s. “Granny Takes a Trip” did re-fashion Industrial Era clothes and tailor garments from precious antique items (such as a William Morris tapestry)! Many times blouses like these are loosely referred to as “Artist” blouse, “Pirate” shirt, or even “Romantic” because of the tendency to think of the covers of a cheesy paperback romance novel or of Jane Austen gentleman. It sure does have an idealistic, bold, flair with its excess of details, in my experience with wearing one now! The deep burgundy satin I chose for the underside of the collar and the cuffs adds of luxurious flair that reminds me of the jewel toned velvet suits of the era, or some sort of masculine loungewear of Victorian times. This pattern was quite exhaustive in complexity, and you certainly can’t rush making this design, but I revel in succeeding with the fine points of sewing. I took time to make sure the chest ruffles laid flat and stayed in place otherwise I knew this blouse would end up feeling like it had a fussy, built-in bib! Each ruffle had its own draft, cut on the bias and folded in half with its own length in different measurements from the others, so everything had to stay clearly labelled until being stitched down…which happened to be the very first step. I serged (overlocked) the raw edges of each of the neck ruffles to keep things clean and simple, with as little extra bulk as possible. 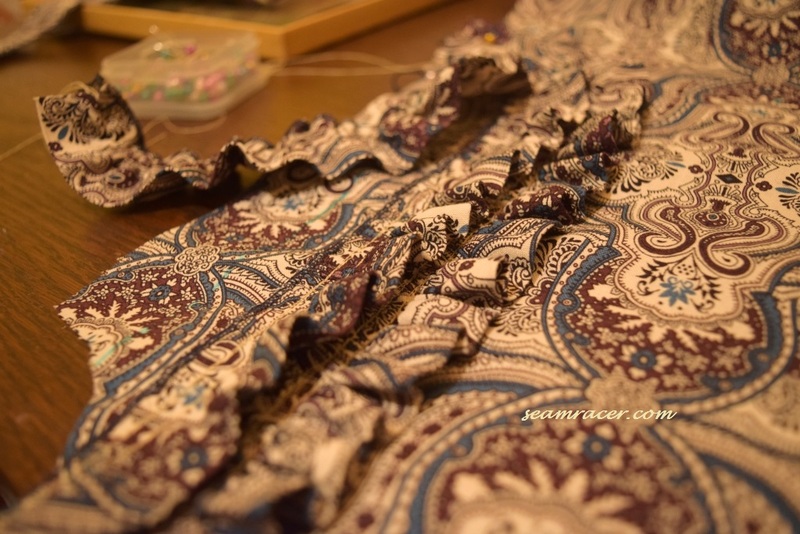 Then, I stitched down each ruffle edge in three rows ¼ inch apart, and lightly steamed the gathers down. 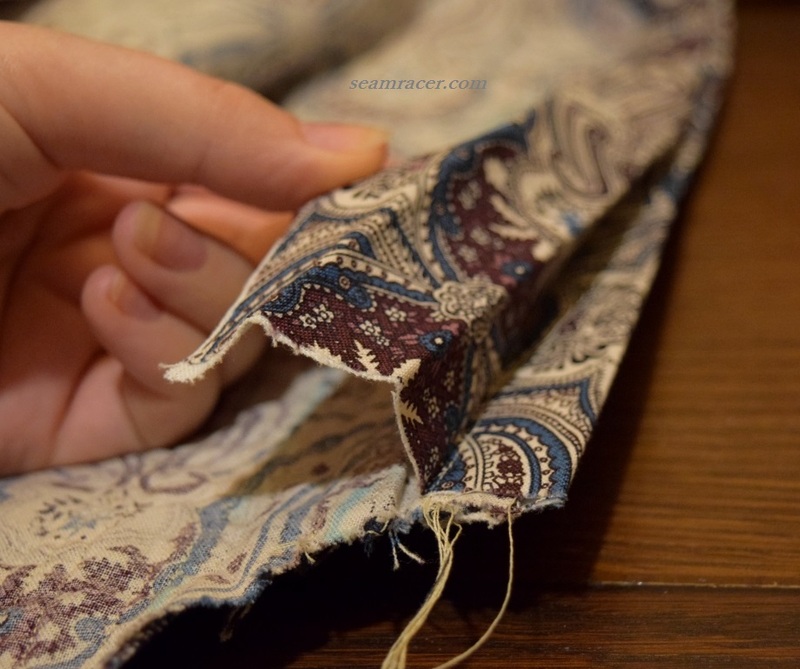 As if that is not time consuming enough, the invisible button placket also has to be finished before the real body of the blouse is assembled. These are tricky, fiddly, things but this is the third one I’ve done through Burda (first here and second here) so there it was much less of a guessing game this time. More or less the left side is a very basic shirt placket while the other (right side) gets accordion pleated four ways. 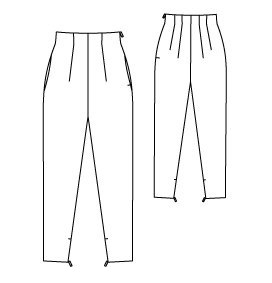 The right placket is two individual plackets cut as one. 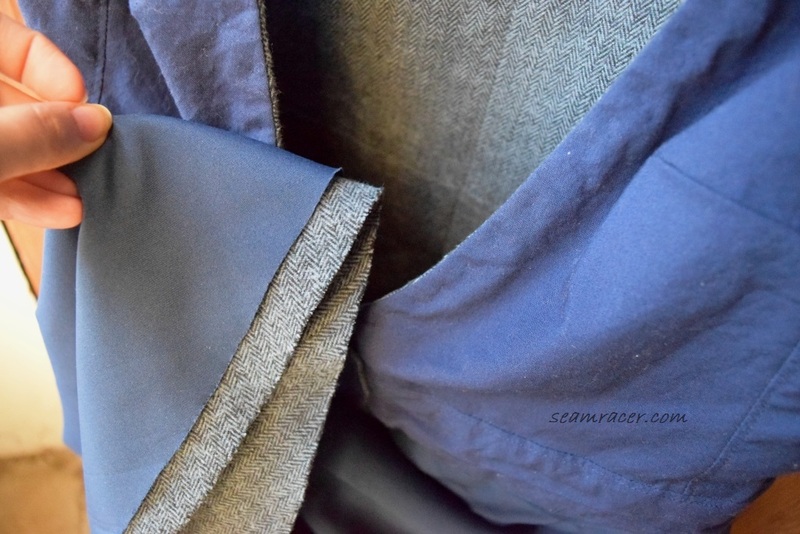 The middle line is folded in on itself to cover the seam allowance and be stitched down “in the (seam) ditch” before you fold the inner (second) placket half (which gets the buttonholes) and also stitch that down through all layers. 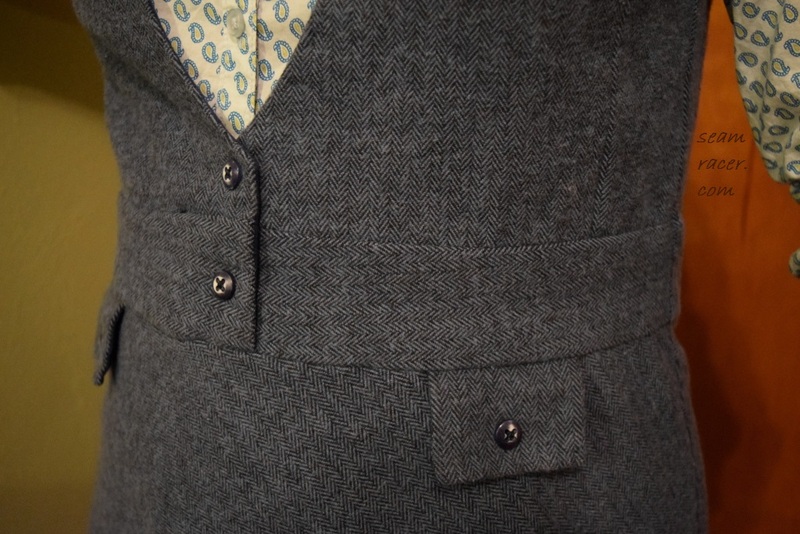 As the final touch, whether it’s mentioned or not in the instructions, I find the two placket layers become one to sight if you tack (by hand) the two together along the edges for only one inch between each of the buttonholes. Besides the preliminary machine stitching to attach the plackets to both shirt fronts, everything else where the shirt closes I did by hand. This way I can be more precise with catching all the different seams and layers, in addition to making the thread invisible. Finally, only then were the darts made and shoulder seams brought together so that the collar and sleeves can be put on. 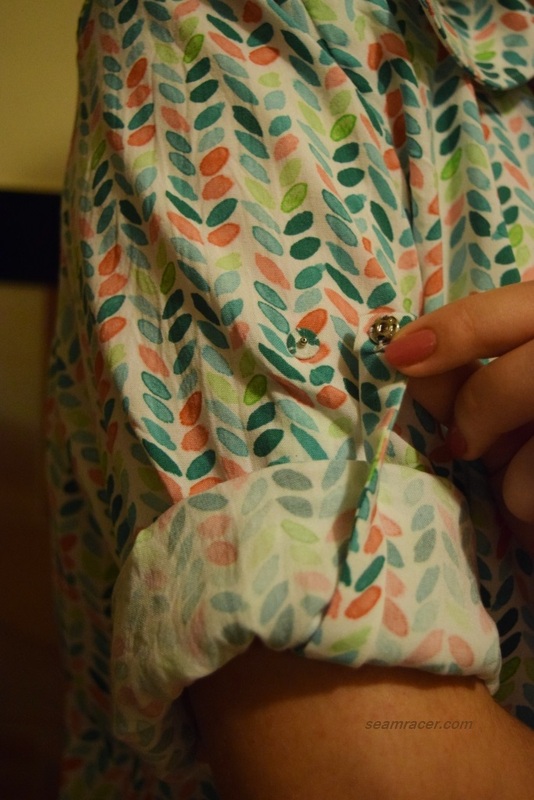 I figured if I’m putting this much effort into this blouse, it deserves the extra effort to be done very well. 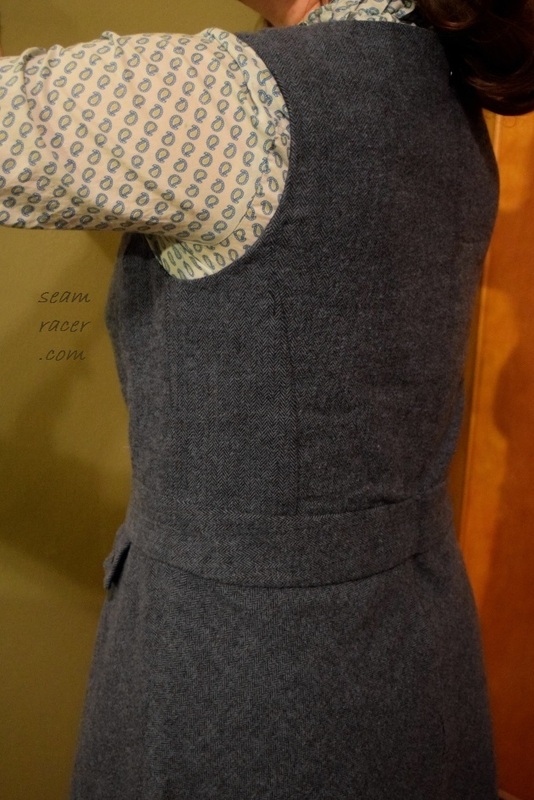 This is why I also top-stitched the collar and cuff edges by hand, too. The finished look is so professional! These sleeve cuffs are so over the top…and I thought the 30’s and 40’s had dramatic arm features! Including the ruffles, the cuffs are 1/3 of the length shoulder to wrist. Keep this into account when you’re making it or if you need more length, because I was thrown off before the cuff was added. I thought I cut too short! The most challenging part of the cuffs was to make sure the ruffles stay out of the way of the seams when you are stitching down the underside (before you turn it inside out). Now, as for any Burda Style pattern, printing and/or tracing is necessary to have a usable pattern to lay on your desired fabric. My pattern was traced from the inserts in the magazine issue, and this set of 60s patterns is a special edition publication not available through the monthly subscription, but most other patterns are available online as a downloaded PDF that needs to be printed out and assembled together. What works best for me is to use a roll of thin, see-through medical paper to trace my pieces out. It’s at this preliminary step that you pick out your proper size. Some people add in your choice of seam allowance width directly to the pattern while some as they are cutting out the fabric pieces. A scissor with a magnetic ruler guide helps immensely to quicken along the step to getting a finished pattern prepped. Sorry to repeat something you might already know, but this is just an “FYI” for those that don’t. Overall, I am so impressed with the quality of this pattern. 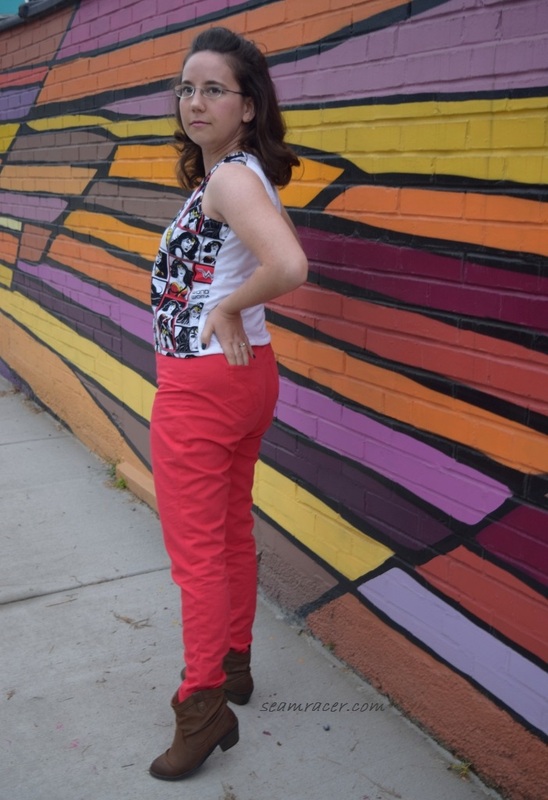 This is probably the best Burda Style pattern I have used yet. 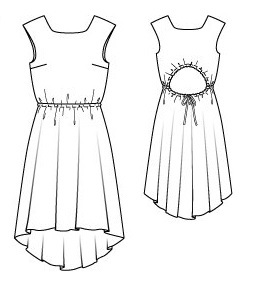 Some Burda patterns are quirky in fit and the instructions can frequently be either lacking or confusing. Not here! The sizing was right on too, and it comfy to wear. 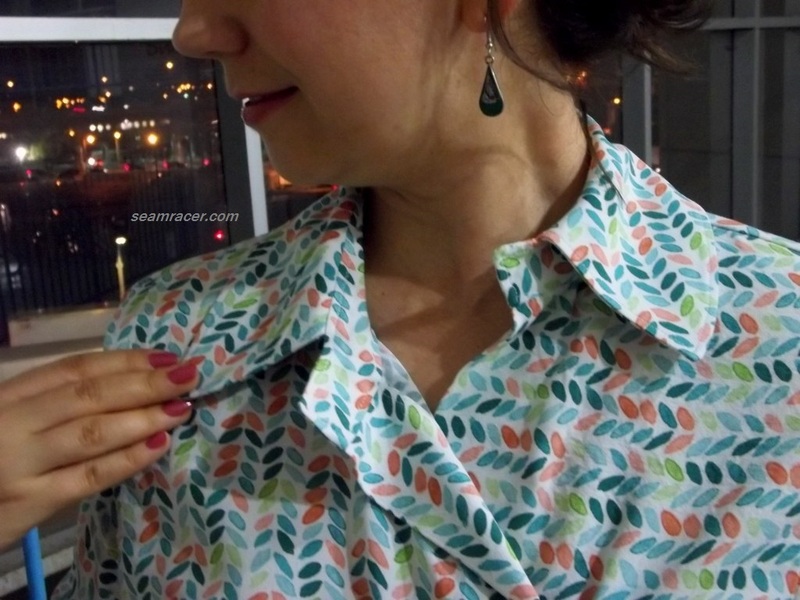 The body shape for this blouse is very straight, and the darts are only ½ inch (or less). I did grade up a size (as I normally do) for my hips and it looks great tucked in or left out. I kept exactly to the pattern for everything except the button placement. The cuffs are so wide and frilly only one button is not enough to close the sleeve ends – I have two per cuff. 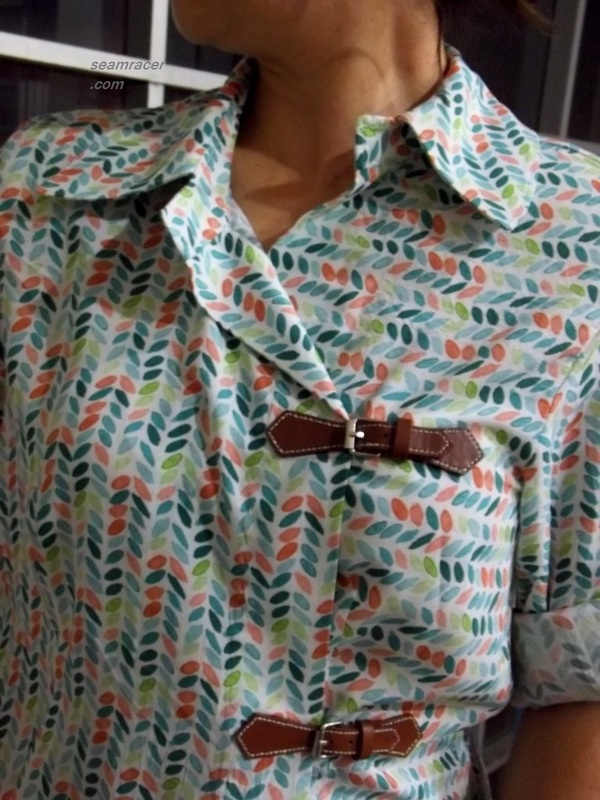 I also added one extra button at the very bottom of the blouse front just above the hem. It makes the blouse look more put together when it’s untucked. I have a whole jar of the vintage grey buttons I used so I was favoring excess, but more buttons do help this design – a small complaint! 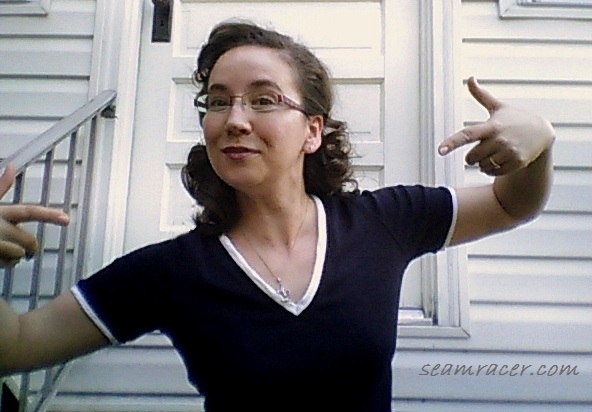 It’s not that I’ve made this blouse because I really love the music of Beatnik or the culture…I don’t really. However, I do love to explore different styles, and I love a sewing challenge, especially one that gives me an in-person reason to wrap my head around a curious aspect of history. This is an era that my and my husband’s parents lived through as late teens/early 20 somethings after all! 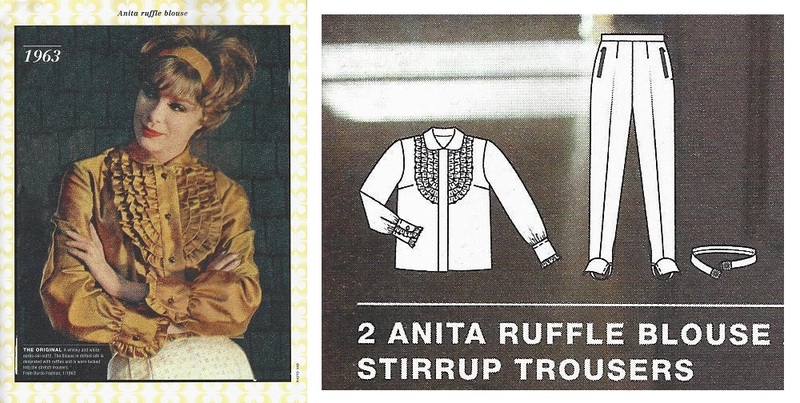 My mom has even said she had a ruffle blouse very similar to mine when she was growing up…I believe she said it was something she bought at Macy’s in New York City on a high school class trip. 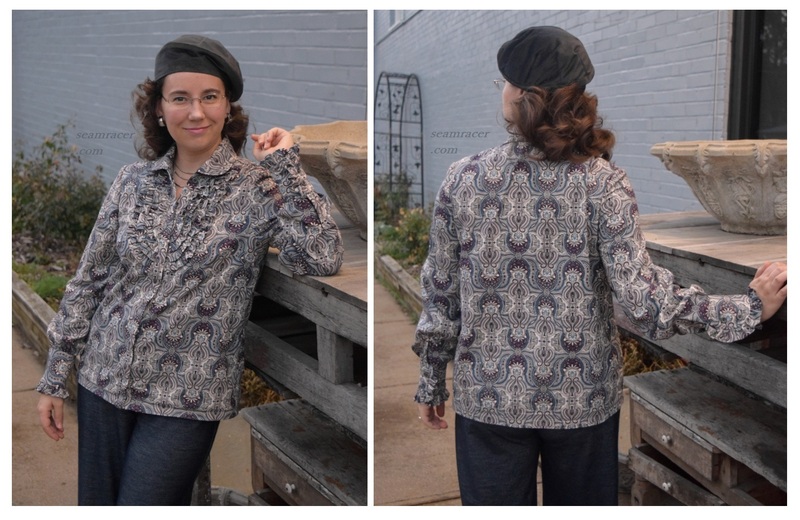 So – maybe I’m just a fashion rebel at heart to go for what tickles my fancy and create this unusual blouse which relives my parents’ times, but maybe that’s just why I like it. Sewing does convey a certain independence, a personal freedom, and an appreciation of details that is in the face of the powerful, overwhelming, ‘buy it on a whim to immediately toss it’ ready-to-wear culture of today. This is my favorite kind of rebellion, one that we need to encourage and nurture today between each other and in the upcoming generation. I don’t necessarily have much fashion that I consider perfect for a very-well attended, full-fledged pop-rock concert. 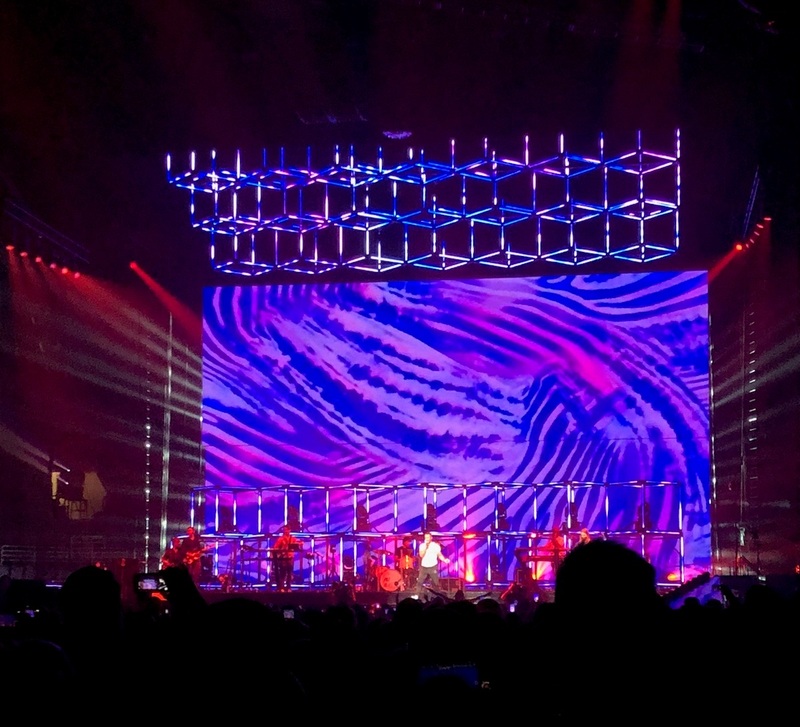 Yet, something new, different, modern, trendy, yet comfy for a long night of dancing and milling with several thousand people was just what I needed recently to see the long trending group Maroon 5 perform in town. You see, my life’s bucket list is long and varied, and I have been fulfilling on that list some of the musical performances I have been wanting to be at for way too long. Maroon 5 has been a favorite of mine since their first big release in 2002, and so going to this concert has been long in coming. I enjoyed every second of that night and felt great in the outfit I wore, too. 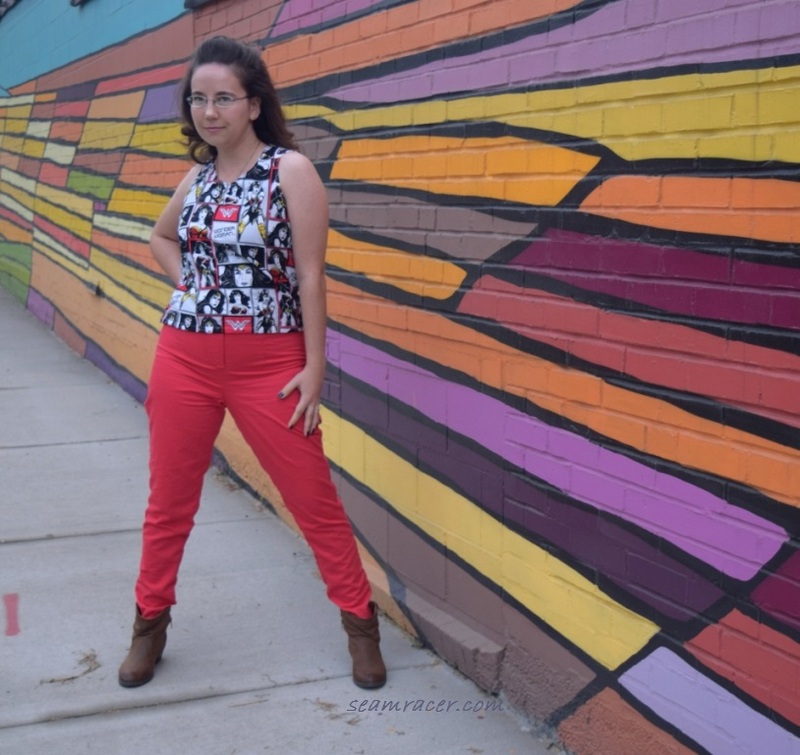 A six year old Burda Style pattern was updated and tweaked so I could be on trend with the asymmetric garments popular for this 2018. 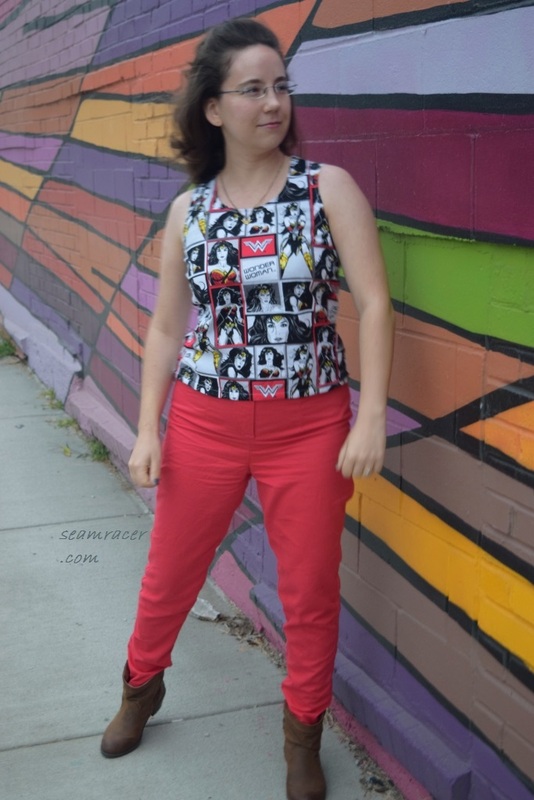 This is my September submission for the “Burda Challenge 2018” for which I pledged a garment a month from them. 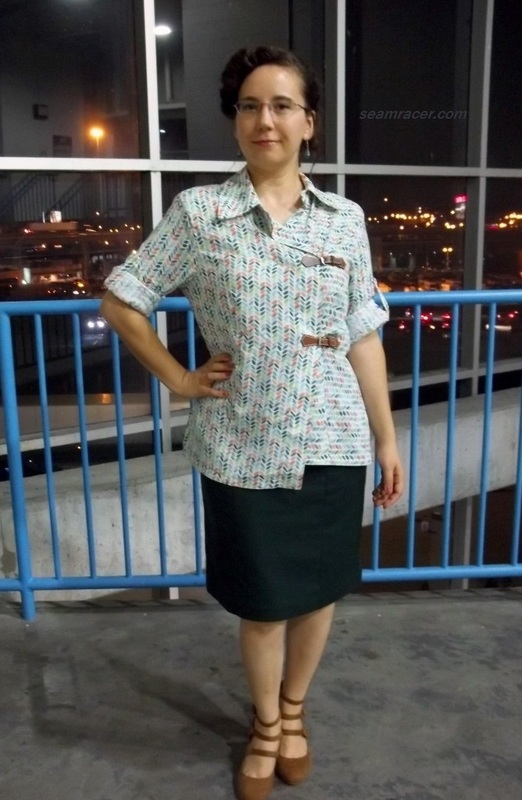 My blouse is worn here with a skirt that I refashioned last year, which you can see in this post. TIME TO COMPLETE: The final touches were put on the blouse the day of the concert – September 13, 2008 – after about 20 hours to make. THE INSIDES: The hem is bias bound, but otherwise all seams are lovely and invisible as French. TOTAL COST: This was a recent buy from my local JoAnn’s. A 2 ½ yard cut was about $25. This beats the $500 or higher price tags on a designer asymmetric shirt!!! Asymmetric features keep popping up in the summer and fall 2018 seasons on the designer runways. It is incorporated quietly mostly into the hemlines of skirts, but also seen in dresses, peplums, jackets, and as part of both men’s (such as this shirt or this blazer or this jacket from Comme Des Garcons) and women’s shirts. I love the asymmetric trend luckily and I had the perfect pattern to put my own spin on it. However, it was actually much harder to find a way to like the trend on myself than I expected. For a blouse, if it’s asymmetric and a button down, it seems to look like either a spin on an ethnic garment or some sort of fancy chef uniform, especially in a solid. It seems that an asymmetric blouse has to be obviously haphazard or have interesting closure details to look otherwise, and I liked this striped version by Ji Oh in the 2018 Resort collection the best, as does Vogue. After all, Ji Oh is supposed to be the specialist in shirts. However, I went for a multi-season and slightly more feminine version with the white, rust orange, lime, and turquoise colored directional vine print. 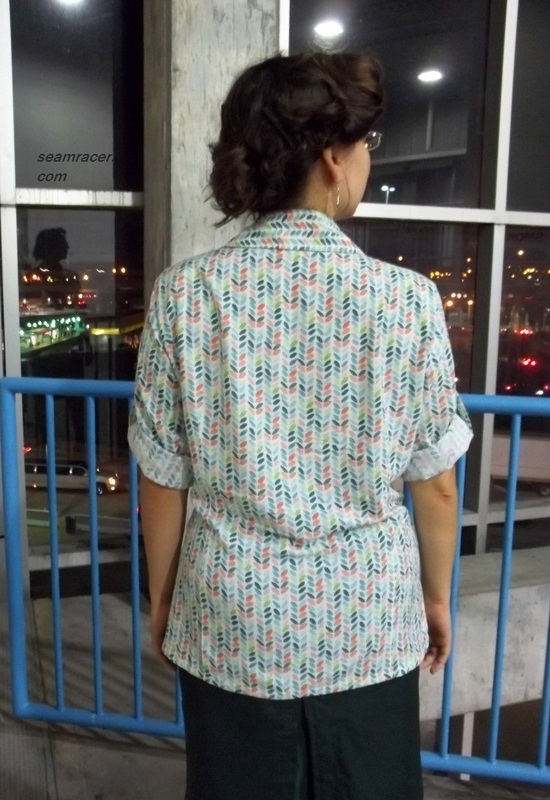 I purposefully trimmed the hem of my blouse fronts crooked (adapting the Burda pattern) and cut the two fronts on differing diagonals, much like this striped shirt from another brand that excels in asymmetric tops, Anouki. I must say that I had the idea for most of these details before I saw many of the inspiration pieces mentioned, but they gave me the guts to go ahead with my crazy thoughts. Perhaps the craziest standout detail which sets my asymmetric blouse apart from any designer inspiration is my original and unique way of closing – faux leather buckle straps. Yes, they are fully workable and not just for display! Yes, it seemed kinda weird to me at first that this was the only way of closing that brought my top to another level of interesting and edgy. 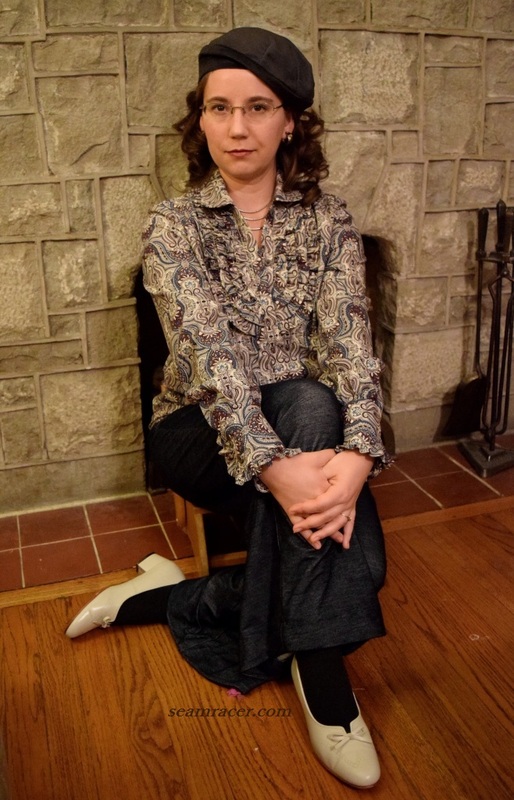 But I already had both of them on hand, and I love the crossover between jacket and blouse that it adds, so I tolerated the miserable amount of hand-stitching that sewing them down required. A small snap closes the wrap front on the inside opposite the buckles. I guess I’m stuck to only hand laundering this blouse because it only occurred to me after they were on that the buckle and straps are meant for purses and might not survive a soaking in the machine wash. I don’t really care too much. High fashion and my dedication to an idea rules over convenience in the case of this blouse. I truly love the result. Now, as for any Burda Style pattern, printing and/or tracing is necessary to have a usable pattern to lay on your desired fabric. My pattern was cut out from a downloaded PDF assembled together after being printed out onto paper, but it can also be traced, using a roll of thin, see-through medical paper, from the inserts in the appropriate magazine issue (although the older issues are harder to find). It’s at this preliminary step that you pick out your proper size. Some people add in your choice of seam allowance width directly to the pattern while some do this as they are cutting out the fabric pieces. A scissor with a magnetic ruler guide helps immensely to quicken along the step to getting a finished pattern prepped. Sorry to repeat something you might already know, but this is just an “FYI” for those that don’t. I must stress that this pattern seems to run very large. 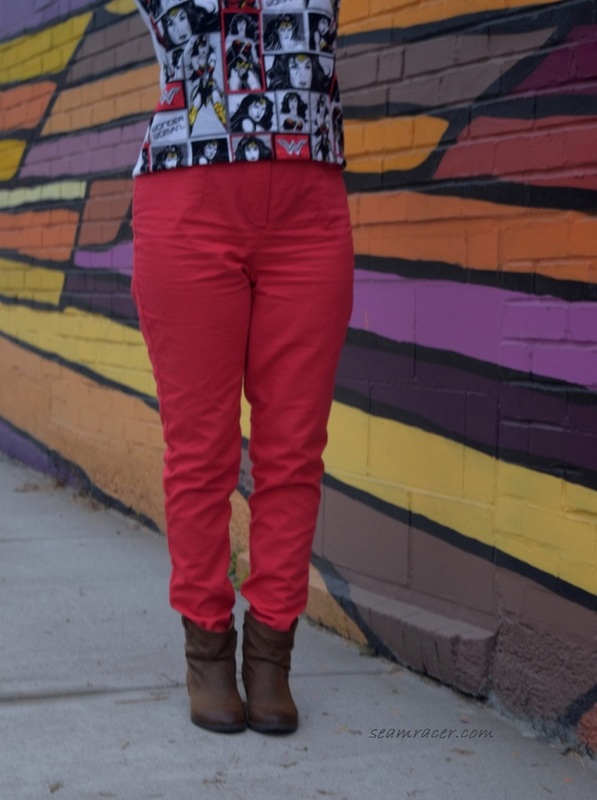 I chose my “normal” Burda size for this and it is quite roomy. I actually don’t mind, though. I don’t really think the wrap front look would have worked as well with a more form fitting blouse, and most of the designer asymmetric designs are loose and comfy in aesthetic anyway. It’s not that there isn’t any shaping, thank goodness. There are two fish-eye darts in the back, and angled half-French darts in the front panels. There are large shoulder pads I added in the blouse and, as they blend right in (you’d never guess they were there, would you), I think the generous fit is all the better. Shoulder pads that are not obvious are when they are just what a garment needs. They add such a subtle definition to the shape here, squaring off the blouse strongly, besides picking up all the excess fabric I had drooping across my chest without them. Even if you are not a fan of shoulder pads and you make this blouse, please add them and you’ll thank me later. Continuing the oversized fit, the sleeves were also very long. I was disappointed at first, but as I wear it more, the top the sleeves actually look good all bloused out at the wrist. That is how all the long sleeved asymmetric blouses are anyway – too long in the arms. It gives me full reach room as well! Yes – I know I should have checked sleeve length first – but Burda blouses have never before come out like this for me, and besides I was finishing my blouse just the day before the event I needed it for. I was definitely NOT going to undo the perfect tiny cuffs that were so hard to get right in order to change the sleeve length. I swear, Burda must have been on crack when they came up with the measurements for the wristband-cuff piece because there is no way it works being that skinny small. I was in misery (cueing off of Maroon 5’s “Misery” song of 2010) literally just making mine work in conjunction with gathering the sleeve end in, too, not to mention no room whatsoever left for buttonholes. I merely did a thread chain loop and a metal hook to close the tiny cuffs. If you want to blow your brains out trying, follow their cuff instructions like me…otherwise add an extra inch in width and save yourself some grief. The delicate cuffs do look amazing, though, when I see them! 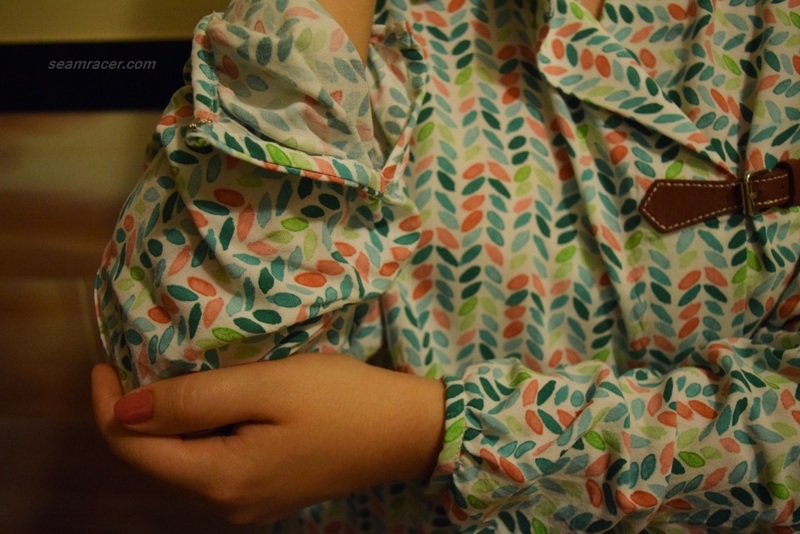 However, I do not want the sleeves always that long, and the rayon challis is so soft and silky that even rolling up the sleeves does not keep them up out of the way. This is why I added sleeve straps 6 inches down from the shoulder line. This is not something that is a part of the pattern and is a self-drafted piece which was entirely an idea of mine. Most shirts which do have such a strap for holding ones rolled up sleeves are cotton or more casual in my experience, but I like the extra interest it adds besides that fact I needed such a detail. 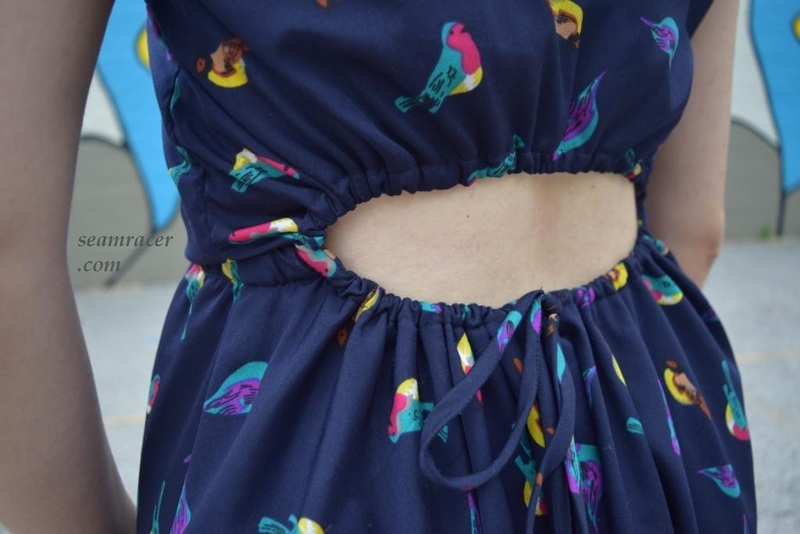 To again break the trend, most mid-sleeve straps are button closed, but mine is fancier than that – a small fabric covered snaps do the job here. The collar leaves me in awe, though. This design is first rate if only for the collar. As tricky and confusing as it was to assemble, it did turn out amazing. Everything matched up, and is actually the best collar (especially one with a collar stand like this) that I have made to date. The neckline pieces are so unusual and very steeply curved to accommodate the asymmetric front. You therefore end up with this lovely bias that still makes a difference in the way the neckline lays so nicely even though it’s interfaced. The right side collar that wraps around asymmetrically is actually wider than the other side and the bias starts right at the shoulder. The left collar is smaller and not as pointed. The neckline collar is rather oversized and almost overwhelming, reminding me of the 1970s, but hey – when it’s this special, you might as well flaunt it and make it noticeable, right!? 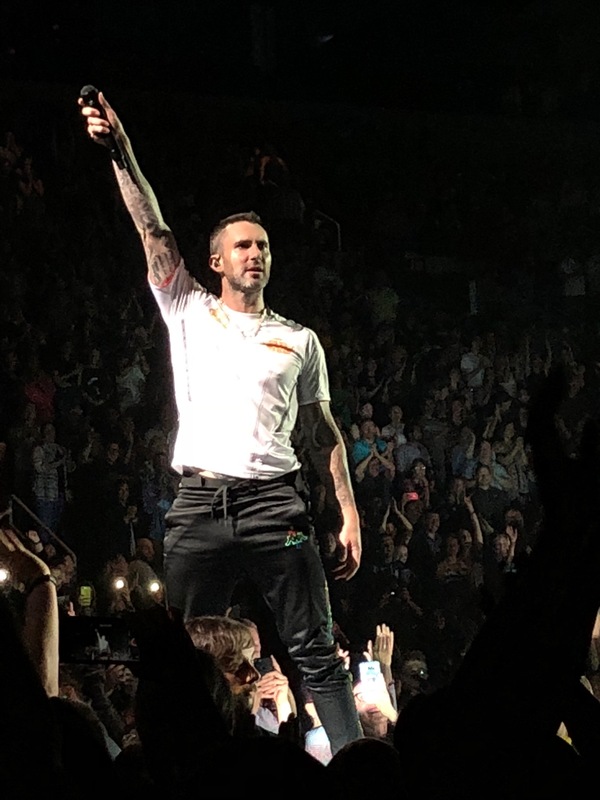 Not that anybody realistically noticed or cared what I had on probably with that many people there, but I am so happy to have matched with what Adam Levine, the lead and vocalist for Maroon 5, was wearing! Not to brag, but we had really good seats and for a good part of the performance we were within a few yards of him. It was go all out or nothing. Do you hear the excited squeals right about now through the screen? So amazing, sigh. Anyway, I did my research on the amazing designer track pants that he was wearing at the concert that night (they were really neat with full embroidery down the sides) and found out that they are Marcelo Burlon County of Milan x Kappa brand Logo Tech-Jersey Track pants, sold online here through Barneys of New York. “Their innovative aesthetic of streetwear with accents of intense color completes the label’s statement-making urban appeal” as described in Farfetched. Oddly enough, the colors in Marcelo Burlon’s secretly feminine logo is pretty much the same colors in my print. We both were channeling New York shown designer style. Even if I was the only one to know (which I’m not anymore after writing this post) I would be happy. I couldn’t have planned it any better, but it wasn’t planned. I was just making something that seemed right. I guess it was just what I was supposed to make for the moment.